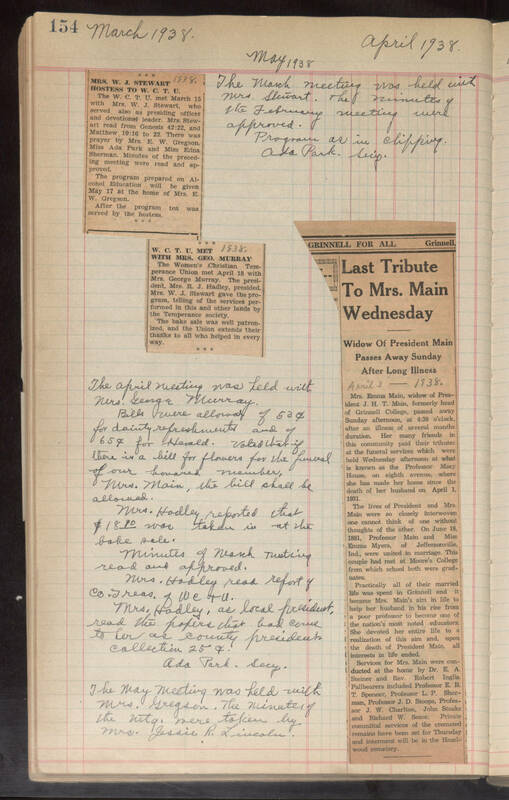 three newspaper clippings on page, one in upper left corner of page, small one in center of page, long one on center right of page 154 March 1938. April 1938. May 1938 The March meeting was held with Mrs. Stewart. The minutes of the February meeting were approved. Program as in clipping. Ada Park Sec'y. The April meeting was held with Mrs. George Murray. Bills were allowed of 53c for daintly refreshments and of 65c for Herald. Voted that if there is a bill for flowers for the funeral of our honord member, Mrs. Main, the bill shall be allowed. Mrs. Hadley reported that $18 90 was taken in at the bake sale. Minutes of March meeting read and approved. Mrs. Hadley read report of Co. Treas. of W.C.T.U. Mrs. Hadley, as local president, read the papers that had come to her as county president. collection 25c Ada Park. Secy. The May meeting was held with Mrs. Gregson. The minutes of the mtg. were taken by Mrs. Jessie R. Lincoln.